Temporary Shutdown of Service Notification one day prior to the start of work. A sample of the Temporary Shutdown of Service Notification is included below. Click here for the CT Sewer Rates Survey . This can be used by residents looking at rate structure comparisons. Description : The Derby Water Pollution Control Authority (WPCA) is responsible for the city’s waste water collection and treatment. The system contains over 40 miles of sewers with 75% of those pipes constructed prior to 1970. The system also includes 4 pump stations owned and operated by the WPCA. Those stations are located at Patty Ann Terrace, South Division Street, Burtville Avenue and Roosevelt Drive. All wastewater flows into the main treatment facility at 1 Caroline Street. Governance : The WPCA is governed by an authority composed of five members appointed by the mayor and approved by the board of aldermen to serve five year terms. No more than 3 members may be from the same political party. The current members are Jack Walsh (Chair), Kelly Curtis, Robert Miani and Rose Marie Pertoso. The operations of the WPCA are subject to regulations from the U.S. Environmental Protection Agency (EPA) and the Connecticut Department of Energy and Environment (DEEP). Funding : The WPCA receives its funding through fees from users of the system. Users pay a flat fee for their connection as well as a fee based on usage. The usage is reported to the WPCA from the water company. These fees are computed annually, and bills are mailed in the fall. Consumers may pay in two installments. Starting with the bills issued in fall, 2018 users are being assessed an annual “capital fee” to cover the costs of the capital improvements being made as part of the 2014 referendum. That cost will be approximately $257 per unit and will be billed annually until the entire referendum costs are paid, which is expected to be at least 20 years. The WPCA continues to make progress on capital items included in the $31.2 million referendum passed by voters in 2014. 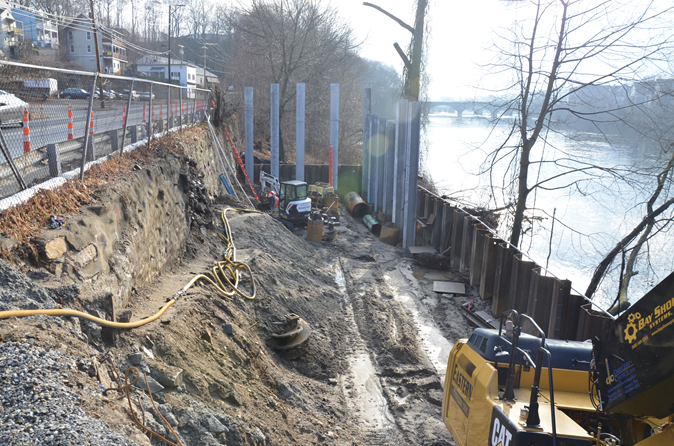 In 2018 Pump Stations on South Division Street and Burtville were completed and work on the very complex and much larger pump station on Roosevelt Drive was begun. Holzner Construction is the firm building the facility that is costing over $7,000,000. Throughout 2018 they completed site clearance and they have built permanent sheeting on the river side and completed much of the work in drilling caissons. At the same time, the structure itself is being built offsite by United Concrete in Wallingford and will be delivered and installed on the site later this winter. The project is slated for completion in June. Design work is also continuing by DeCarlo & Doll on the improvements along Rt. 34. In an effort to save on expenses and improve the project, the work is being done in conjunction with the coming improvements to RT. 34 being done by the CT Department of Transportation. The state expects to go out to bid on the project in August and the DPW work will coincide with that project. Derby WPCA is also participating in a Regional Wastewater Treatment Consolidation Study along with Ansonia, Seymour, Beacon Falls and Naugatuck to study the feasibility of any possible collaborations/consolidations among the cities that could be beneficial. 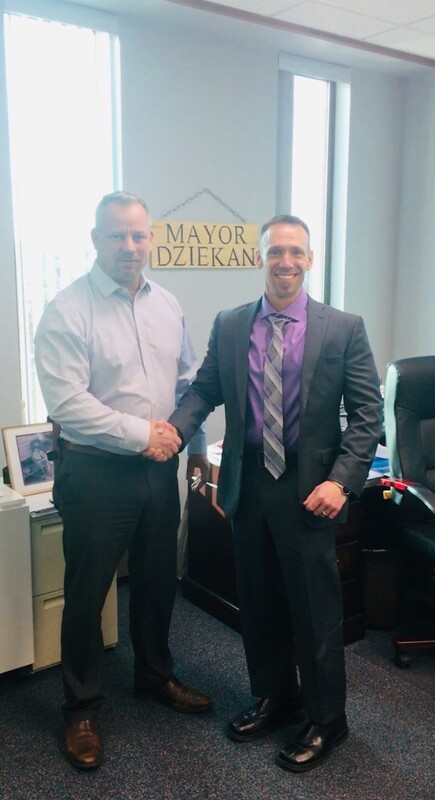 The $1.35 million study is funded by the State of Connecticut Office of Policy and Management (OPM) and administered by the Naugatuck Valley Council of Governments. Phase 1 of the study has been completed. That part of the study analyzed conditions and capacities at facilities in all of the towns involved and also came up with a list of potential alternatives for regionalization. 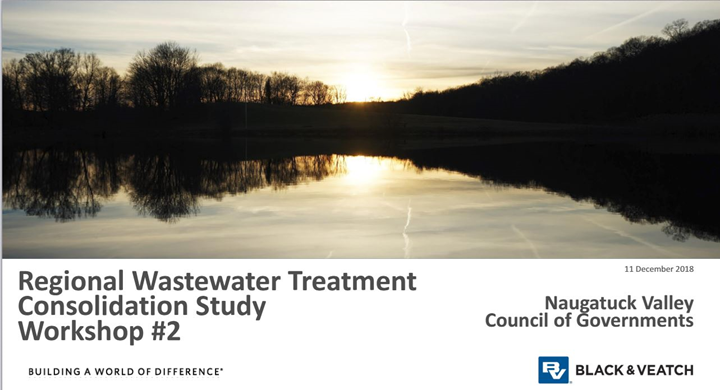 All of the information developed to date can be found on the Naugatuck Valley Council of Government’s website and you can access it at https://nvcogct.org/content/regional-wastewater-treatment-consolidation-study. Phase I clearly identifies the poor conditions of Derby’s physical plant that were the basis for the passage of the 2014 referendum. Phase II of the study will hopefully narrow down the list of alternatives to those that are not only feasible, but also cost effective. Work on the physical plant in Derby has been on hold since the study was begun, but WPCA is now investigating options to alleviate some of the issues originally identified that could also be useful if and when a regional alternative is developed. WPCA has recently developed an Infiltration / Inflow (I/I) Control Plan, in accordance with an EPA Clean Water Act Consent Order, to help reduce the amount of clean water entering our sanitary sewers. We have previously conducted an extensive Sanitary Sewer Evaluation Survey to identify and quantify these sources of clean water entering our sewer system. We are now ready to begin implementing the necessary repairs to the sewers. 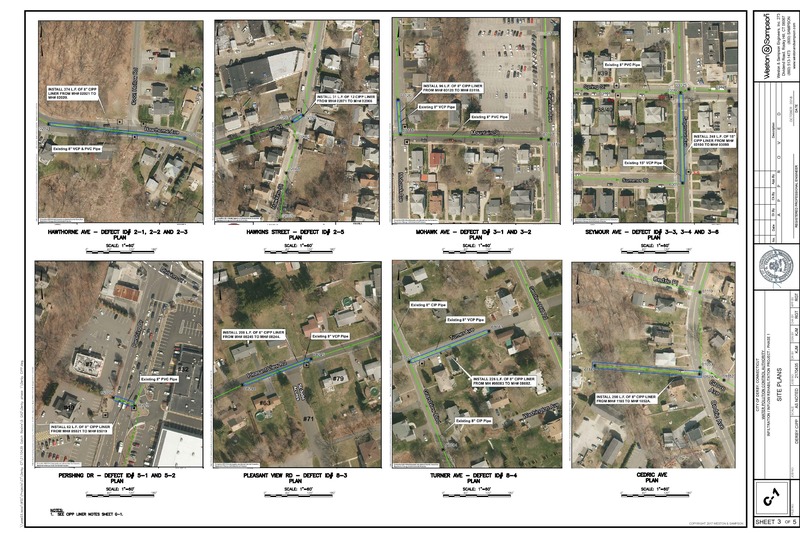 During the months of February and March 2019, the WPCA will be installing liners in the existing sanitary sewers in the following areas: Cedric Ave, David Humphries Road, Hawthorne Ave, Hawkins Street, Mohawk Ave, Pershing Drive, Pleasant View Road, Seymour Ave, Turner Ave.
Impacted residents and businesses within the project areas will be provided with a “door hander” with additional information about the project. The flyer, along with figures outlining the work areas, will be posted to our website. The City of Derby sanitary sewer system provides service to over 12,000 customers and contains over 216,000 linear feet of pipe. The wastewater is transported to and treated at the Derby Water Pollution Control Facility (WPCF). If the capacity of the sewer system is exceeded or if blockages occur, overflows may result. Untreated wastewater overflows that occur upstream of the WPCF are called Sanitary Sewer Overflows (SSOs). SSOs are a threat to public health and the environment because the SSO may discharge pollutants such as pathogens, floatable materials, toxics and other pollutants, all of which may impact public health, drinking water supplies, water quality, and/or aquatic ecosystems. The City of Derby WPCA's goal is to document and prevent (or mitigate) overflows whenever possible, to deal efficiently with the effects of such events, and to protect public health, environment, and property. While the City's collection system is old and prone to failures, a quick response and an aggressive maintenance and replacement plan will minimize the impacts. Abel came to Derby after seven years in Milford and Stamford where he steadily rose through the ranks including earning a Class III Operator license which is required to run the Derby plant. Derby WPCA is in the midst of major changes prompted by the passage of a $31.2 million dollar referendum in 2014 to upgrade the Derby plant and system. To date, the Authority has completed new pump stations at South Division Street and Burtvillie and is in the midst of building a new station on Roosevelt Drive that will be completed by June of next year. It has also been working on an ongoing plan to reduce water infiltration to the system by repairing and replacing pipe in the system. A major part of that work is involved in the upcoming reconstruction of Main Street. The Naugatuck Valley Council of Governments is also about half way through a regional study that could have a major impact on the future of the plant on Caroline Street.